Anyone with an emergency fund should have a high yield savings account. It’s the best tool to battle inflation while helping you sleep soundly knowing you have some money stashed away for a rainy day. But wait a minute…before we start talking about where to put an emergency fund, do you really even need one? Great question. You might not. 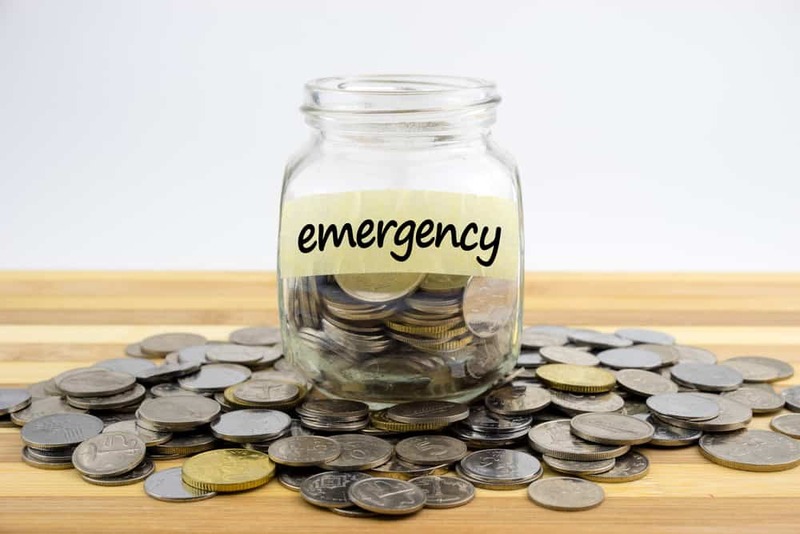 Do You Actually Need an Emergency Fund? This has been a hotly contested question for some time. Typically, you see traditional money experts explaining that you should have 3-6 months of income set aside in an emergency fund. On the other hand, you have smart investors on their way to financial freedom explaining that it might not be necessary to have any type of emergency fund (and it actually comes with a huge opportunity cost). If you’re hoping to achieve financial freedom any time soon, then making the right choice about where to invest your money is absolutely critical. Both sides make valid arguments. Those in the pro-emergency fund camp are usually more conservative. They value the safety of knowing they can pay for unexpected expenses without having to dip into retirement savings. Easily pay for…emergencies: Life is full of surprises. 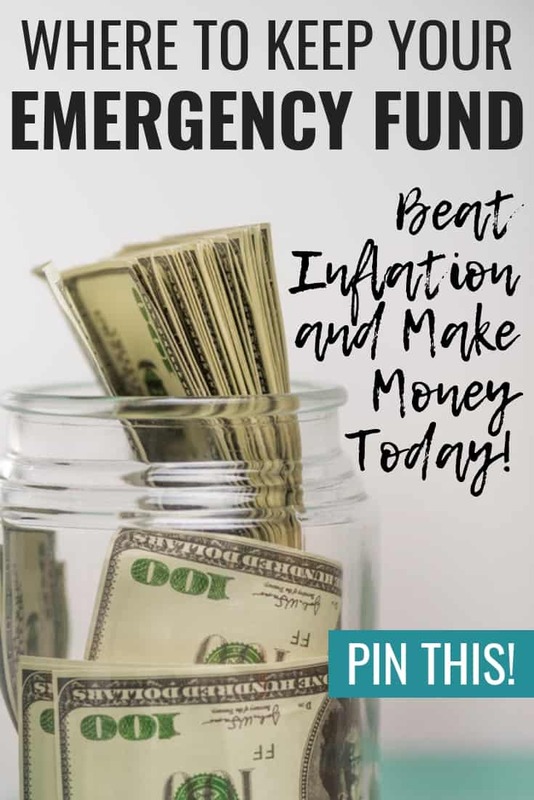 An emergency fund can help keep you covered without interrupting your long term investments if something like a high medical bill or layoff comes your way. Relieves stress: If having a completely liquid and safe stash of cash helps you sleep at night, that alone may be worth it. Those on the other side of the spectrum see the opportunity cost of having a large sum of money sitting on the sidelines. A simple S&P 500 index fund will start to grow that rainy day fund pretty quickly. Investments are still liquid: Those on the other side of the emergency fund argument are not calling for no savings of any kind. Rather, they call for investing their savings. While those investments (typically equity-based) can go up and down, they can still be withdrawn in a time of true emergency. Meaning, you don’t need a separate “emergency fund” if your investments (savings) can be used if necessary. 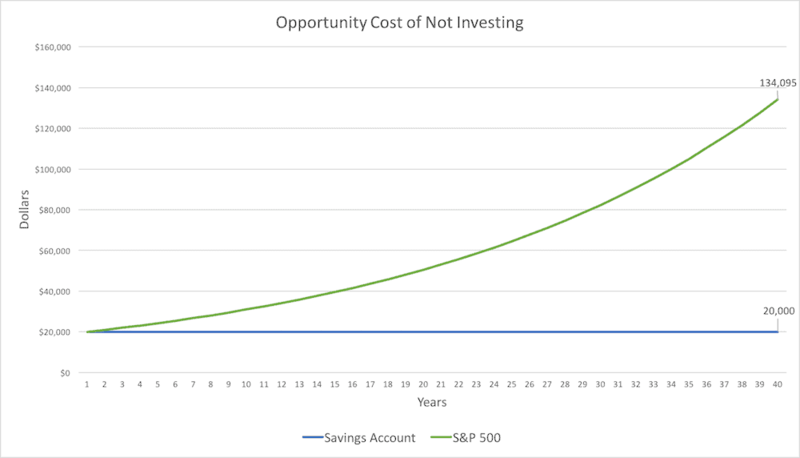 The opportunity cost: Say you make $40,000 a year and follow the tried and true rule of having a 6-month emergency fund. That’s $20,000 sitting in a bank rather than in an S&P 500 index fund. If the S&P 500 returns +5% (after inflation), over 40 years that would be $114,000 that you missed out on because of your emergency fund. Where do I stand? In the middle, but leaning towards the anti-emergency fund side. I think it’s useful to have money stowed away for unexpected costs, but it shouldn’t be sitting under your mattress (or in a checking account for that matter). At the end of the day, it’s up to you to decide if you should have an emergency fund. If you do want one, you also need to decide how big it should be. If after reading this far you’ve decided you want some sort of emergency fund, a high yield savings account is a great place to store it. A high yield savings account is exactly what it sounds like – a secure and liquid savings account, but with a higher yield. Otherwise stated, it pays a lot of interest. Right now (January 2019), some of the best high yield savings accounts are paying around 2% in interest. This means for every $100 you have in the account, they will pay you $2 per year. Compare that to bond index funds which are yielding around 3% and it doesn’t seem so bad (worse, but not so bad). Compare it to a regular savings account that yields 0.01% (yes, one penny for every $100) and it seems fantastic. In a world where inflation averages around 2-3%, a high yield savings account does a good job of maintaining your spending power. Let’s dig into some other pros (and cons) of high yield savings accounts. Safety: High yield savings accounts are typically FDIC insured for up to $250,000. It does not get much safer than that. Stability: While bonds, stocks and other investments move in price/value, money in a bank account never will. You can rest easy knowing the numerical value of your money will not drastically dip overnight (although, the value will due to inflation). Yield: A high yield savings account provides a better interest rate than typical savings and checking account. In some cases, over 100x better. This helps combat inflation and maintain your purchasing power over time. Convenience: You can gain access to your money in just a couple of days (through an online transfer), if not sooner. Convenience: Yes, what is a pro to some is a con to others. Most high yield savings accounts are online only. This is how they keep costs low and interest rates high. While some folks (typically, millennials) prefer using online-only services, others (most often, boomers) will likely miss the option of going into a physical branch. A high yield savings account is the best, but not your only option for an emergency fund. Below are some other reasonable options you could explore. Money Market Accounts are bank accounts that typically require a higher minimum balance, but in exchange, they offer better interest rates and check writing ability (something usually only available with checking accounts). High yield savings accounts often offer the same (if not better) interest rates compared to money market accounts. This means the only real benefit is the ability to write checks, while the huge downfall is maintaining a higher minimum balance. Can you imagine having an actual emergency, depleting your funds, and then having to pay a bank fee at the end of it all? A Certificate of Deposit (CD) is an account with a fixed time period over which you will be paid a higher than the average interest rate. However, you cannot access your money during that time period without paying a penalty. Essentially, you are giving up the immediate right to your money in exchange for better interest rates. While you can get higher interest rates with a CD, the lack of instant access to your money makes it a less viable solution for an emergency fund. They are better suited for large, known costs in the near future (i.e. college tuition payments). Bonds provide a nice middle ground between bank accounts and stocks. They offer a moderate return and have moderate risk. Therefore, a moderate risk taker would find comfort knowing they are getting a slightly better return (around 3% in early 2019) for an investment that is much safer than most stocks (but not 100% insured like bank accounts). Arguably, using an equity index fund or ETF for an emergency fund is the same as having no emergency fund at all. It’s a relatively safe bet that the growth likely to come out of stocks will outweigh the risk of you pulling all of your money out at a market downturn. The risk is real and bound to happen to someone (you’d just have to hope it’s not you). Here’s a quick scenario analysis of what could happen if you invest your emergency fund. It’s not exhaustive but helps paint the picture. Under these assumptions, stocks grow by 7% and a high yield savings account by 2%. Worst Case: Immediately after investing your $20,000 emergency fund the market dips and drops to half its value. Your $20,000 is now $10,000. At the same time, you need to withdraw $5,000. Middle Case: Halfway through life, you need to use $10,000 on an emergency. Best Case: You never touch your emergency fund. 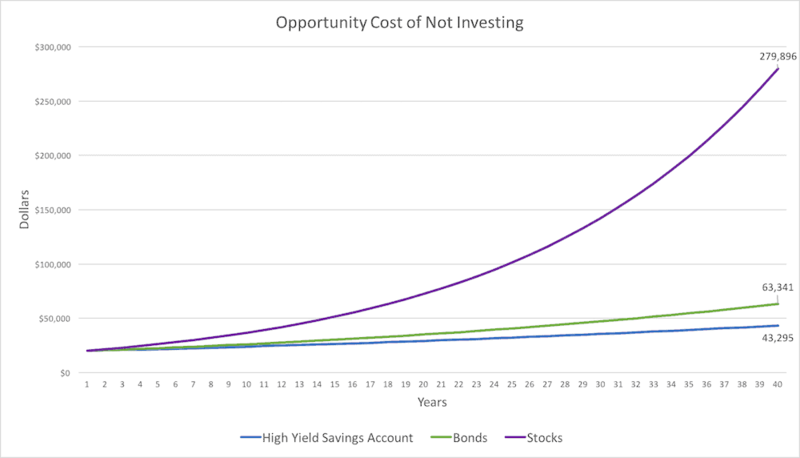 Best Case with a High Yield Savings Account: You never touch your emergency fund, but it was in a high yield savings account rather than stocks. 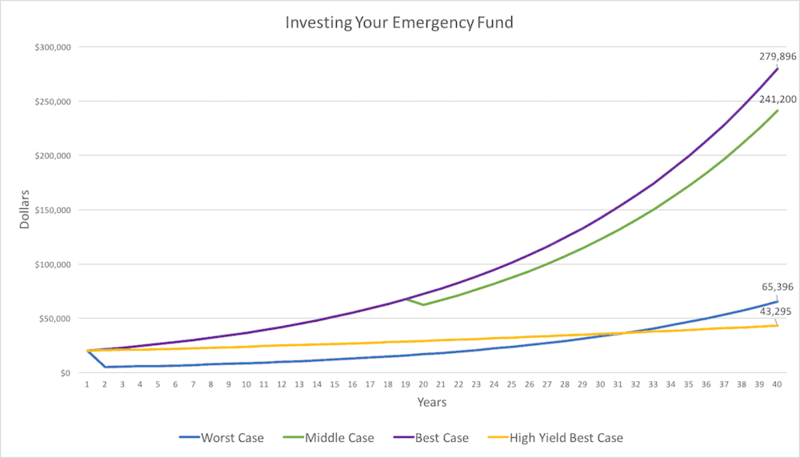 As you can see, even the worst-case scenario when investing your emergency fund turns out better in the long run than the best case scenario while using a high yield savings account. Obviously, there are other scenarios where you could be worse off (what if you needed the full $10,000 right after the market dips? Then you’d be 100% out of funds). These are all very low probability scenarios, though, and it’s up to you to decide what level of risk you are comfortable taking on. In summary, there are two things you should remember from this article. The first is that emergency funds are not right for everyone, only you can decide if you need one. Second, the options above are not mutually exclusive. A popular strategy and one I employ is to hold just a couple months (or less) of savings in high yield savings account while investing the rest in various bond index funds and ETFs. Being a young investor, I know I can first draw on my savings account, then my bond funds, and lastly (hopefully never needed) my equity funds. And in the meantime, my money is working for me rather than losing value over time. Just Start Investing is a personal finance website that makes investing easy. Learn the simple strategies to start investing today, as well as ways to optimize your credit cards, banking, and budget. What is your take on having (or not having) an emergency fund? What’s your savings and safety-net strategy? Leave us a comment below! Thanks for sharing! I think it’s an important lesson in that ALL of your money can and should be working for you.